BIG music in the Watkinson! 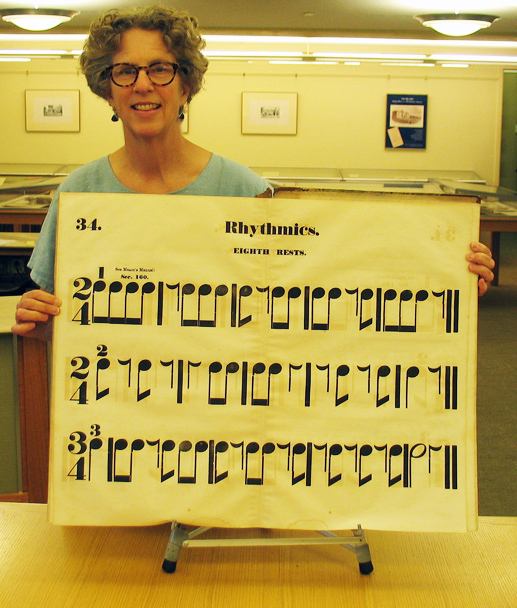 These large musical scores were printed in 1851 on “White & Potter’s Steam Press—4,000 impressions per hour—Spring Lane, Boston.” As a printing feat they are impressive—rich black notes, easily seen at a distance. 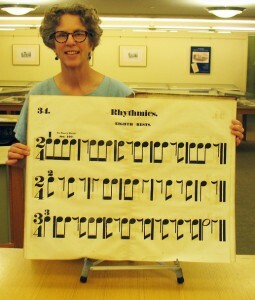 Lowell Mason’s Musical Exercises for Singing Schools promotes the use of the large printed score as a way to speed along the teaching of music in the classroom. They were meant to free the teacher from drawing scores on the blackboard. The exercises accompany Mason’s Manual of the Boston Academy of Music. Mason and George James Webb established the Academy to promote music education in general and to raise the standards of church music. The academy had enrolled 3,000 students by its 2nd year. Mason was credited with introducing music education in public schools. His influence on church music was equally felt, promoting classical European music rather than the American music of the revivalists, such as Joshua Leavitt’s Christian Lyre. Comments Off on BIG music in the Watkinson! This volume, owned by one Alexander Gilles, is a copy of Isaac Watts’s Psalms of David Imitated in the Language of the New Testament. Isaac Watts is a major figure in early American music history. His psalm paraphrases and hymns were sung to existing sacred tunes throughout the British colonies from the time they were published in London in the early 18th century (1707 for his Hymns and Spiritual Songs, 1719 for The Psalms of David). Decades after Watts died in 1748 his poetry exerted a strong influence on musical trends, inspiring the New England psalmodists who were America’s first homegrown composers to write more elaborate and demanding music in the 1770s and 1780s. Yet while Watts’s poetry remained immensely popular during and after the American Revolution, his frequent references to “Northern Isles,” Britain, and kings were awkward for patriotic church-goers. 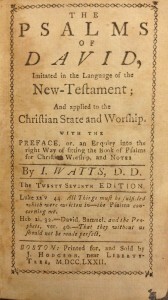 In 1781 Newburyport printer John Mycall brought forth a new edition of Watts’s psalms from which all references to Britain had been scraped away by a committee of ministers. 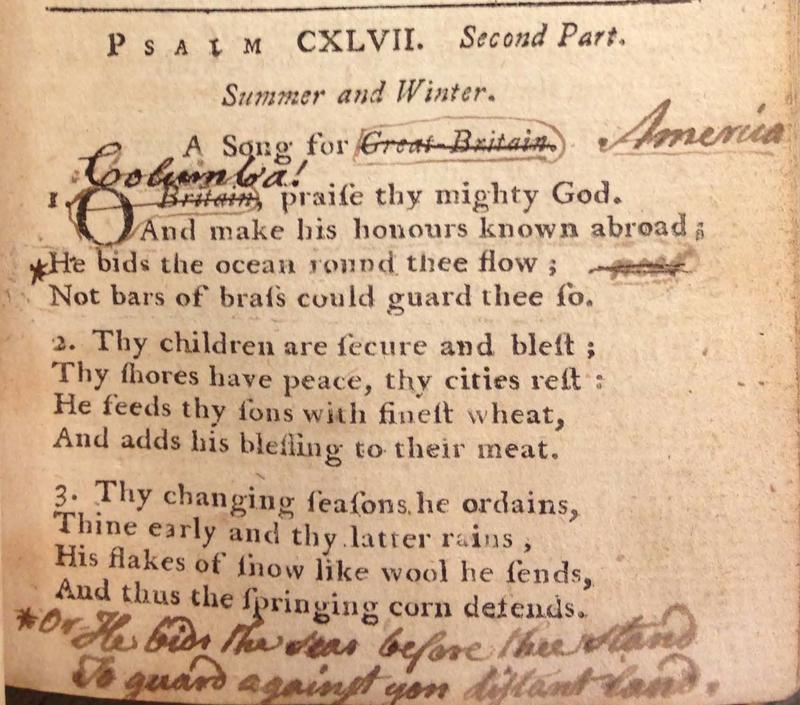 Four years later Joel Barlow released a “corrected and enlarged” edition of Watts’s psalms. Barlow had been commissioned by the General Association of Connecticut, which decided in June 1784 that they needed a version that omitted all references to Britain. In 1797 Timothy Dwight was asked to make a new revision by that same General Association. From 1781 to 1832 there were nine distinct revision projects that yielded at least 75 different editions or printings of Watts’s psalter. Alexander Gilles’s patriotic enthusiasm for revising Watts surpassed the official revised versions. His corrections are largely based on Mycall’s 1781 edition, but Gilles added further changes wherever he felt Mycall’s ministers failed to be thorough or go far enough. 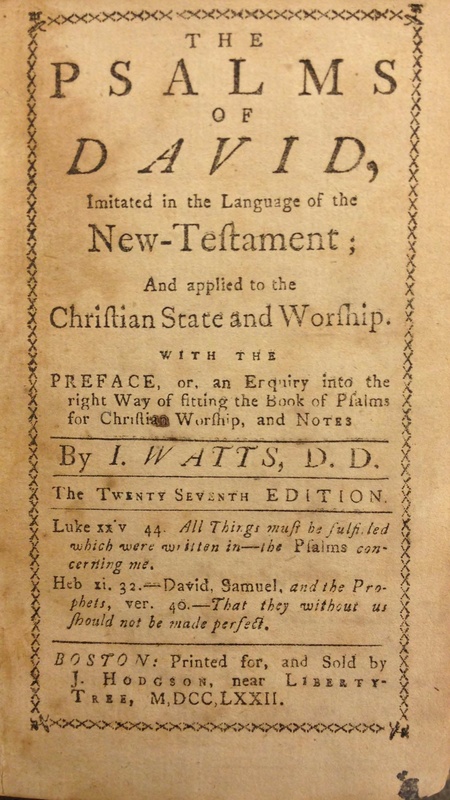 In more than one instance where Mycall’s edition left “islands” or “islands of the Northern sea” Gilles wrote “nations” or “Western lands.” Bound in with Gilles’s copy of the psalter are a 1772 Boston edition of Watts’s collection of Hymns and Spiritual Songs and a collection of hymn tunes by the Connecticut composer Andrew Law, and Gilles made adjustments to the language throughout those materials as well. Even the index is redacted. Occasionally Gilles contributed entirely new poetic lines that highlighted his patriotic and anti-British sentiment. 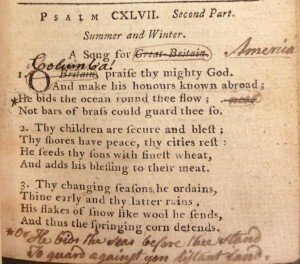 For example, in Psalm 147 he wrote corrected the subtitle and first line of lyrics based on the Mycall edition, but also suggested changing the lines “He bids the ocean round thee flow / Not bars of brass could guard thee so” to “He bids the seas before thee stand / To guard against yon distant land.” It’s not hard to imagine that “yon distant land” is Britain, against which Gilles summoned God’s protection for the young nation. The American Revolution and its aftermath receives plenty of attention at the blog I write for, The Junto, particularly with our coverage of The American Revolution Reborn conference in Philadelphia. Yet much remains to be said about the Revolution’s cultural reverberations, particularly when it comes to sacred music. Gilles’s annotations bespeak a man of diligence and creativity who committed to aligning his religious practice with his patriotism. One wonders if there are more annotated hymnals out there that display other attempts to reconcile sacred worship to patriotic politics. Moreover, further examination could reveal musical consequences from the changes to the psalms and hymns. Last week Roy Rogers suggested we need more sources on the intersection of Christianity and the Revolution. Gilles’s volume seems like a great example of such a source, leading me to wonder if we should be paying more attention to how sacred music responded to and was affected by the Revolution. Louis F. Benson, “The American Revisions of Watts’s ‘Psalms’,” Journal of the Presbyterian Historical Society 2, no. 1 (1903): 18-34. You are currently browsing the I Found It at the Watkinson! blog archives for July, 2013.